MANHATTAN (CN) — For the first time in U.S. history, ordinary citizens fought in court Wednesday to have a president’s business dealings declared as violations of anti-corruption provisions of the Constitution. 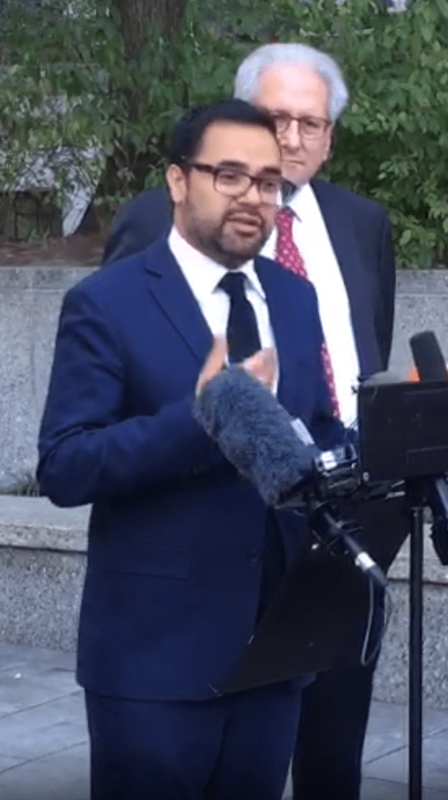 “Diplomats are bragging that they’re going to this president’s hotel to curry favor with him,” attorney Deepak Gupta argued this morning in the unprecedented hearing. Giving no indication of how he would decide this groundbreaking issue, U.S. District Judge George Daniels vigorously put both parties on the defensive with a series of sharp questions during 2 1/2 hours of arguments. “You both are in uncharted waters,” Daniels said at one point. On Trump’s side, Deputy Assistant Attorney General Brett Shumate insisted that the federal judiciary has no role in enforcing the previously obscure clauses. “The court lacks jurisdiction to issue an injunction against a sitting president of the United States,” Shumate said in court Wednesday. Blasting this as an “extreme view,” Gupta described this interpretation of the separation of powers as a recipe for impunity. “I want to address the government’s view that the president is above the law,” said Gupta, an attorney with the firm Gupta Wessler. To earn the right to take the president to court, Gupta will have to prove not only that the president’s business dealings are illegal, but that his clients have been harmed by them. For lead plaintiff CREW, a group dedicated to rooting out conflicts of interest in government, the task of keeping tabs on Trump’s global business empires has required constant vigilance. Gupta’s other clients in the hotel and restaurant industry meanwhile have been put in the position of competing directly with the president. Hotel booker Jill Phaneuf, who works for the Kimpton Carlyle Hotel and the Kimpton Glover Park Hotel on Washington’s Embassy Row, alleges that the diplomats among her clientele are more likely to turn to the Trump International Hotel. If the case goes to trial, Gupta promised, the court would see that Trump’s Washington hotel charges higher rates than the competition, even while it has lower occupancy rates, to cater to an elite clientele. “That’s because it’s an emoluments magnet,” he said. Gupta told the court that he has numerical proof of Trump’s competition with another of his clients, New York hotel mogul Eric Goode. Ranked 35th in the area, Trump SoHo’s price differs by only $1 from Goode’s Bowery Hotel, which outranks its nearby competitor by two points but has an important drawback. “What our clients can’t offer is the ability to curry favor with the president of the United States,” Gupta said. Daniels appeared skeptical that Gupta has shown enough to prove standing, the legal principle showing one has been personally affected by conduct that brought them to court. “Why do they have that right?” Daniels pressed. The judge noted that Gupta’s clients would still be competing with the president of the United States regardless of whether Trump illegally accepted foreign cash. Shumate, the Justice Department attorney, depicted Trump’s businesses as just like any others in the highly competitive hospitality fields of New York and Washington. “What the plaintiffs want you to assume is that President Washington was a crook,” the government’s attorney added later. Apparently unimpressed by the comparison, Daniels noted that the legislative branches of their time might not have been concerned that these businesses posed any conflicts of interest with foreign governments. “They were not particularly concerned with George Washington selling tobacco,” he said. Daniels posited that the Framers intended the clauses to be a “prophylactic rule” preventing conflicts before they arise. Since the emoluments clause proscribes certain foreign business transactions only “without the consent of Congress,” the Republican-led Legislature presents another variable in the case. “Your clients would not have a cause of action no matter how severe [their complaints] if [Congress] decided to consent,” said Daniels. Though no federal courthouse may have heard an emolument case before, Gupta argued that internal rulings the question from the White House’s Office of Legal Counsel embody longstanding precedent that the Trump administration has ignored. Two former White House counsel — under Presidents George W. Bush and Barack Obama — have joined the fight against Trump. Obama’s ex-attorney Norm Eisen addressed reporters at a press conference after sitting at the plaintiff’s table throughout this morning’s hearing. “This case involves constitutional provisions that have rarely been litigated in the centuries since the Framers included them in our Constitution, but the case implicates concerns about corruption of American officials by foreign and domestic governments that are as vital today as they were in the 1780s,” Eisen said. Gupta’s co-counsel Joseph Sellers, from the Washington firm Cohen Milstein Sellers & Toll, called the government’s comparison of Trump to the first president of the United States a “gross mischaracterization” of history. Judge Daniels ended Wednesday’s hearing with plans to issue a ruling in the next two months. If he allows the case to proceed, the challengers estimate that they will pursue a weeklong trial seeking Trump’s divestiture from his businesses. 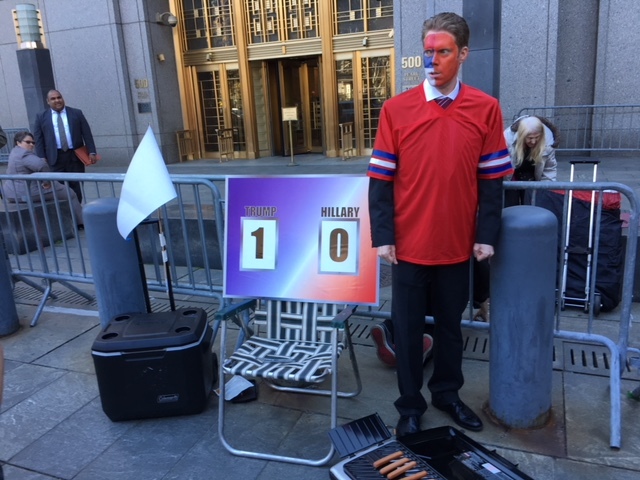 Eagerly awaiting the judge’s call, a young man waited outside the courtroom dressed in a red, white and blue football jersey and matching face paint. He stood next to a folding chair and a grill top covered in hot dogs. The punchline was apparent: Just the previous day, the Trump administration lost its first federal court battle over the third iteration of its travel ban against Muslim-majority nations, one of a long line of defeats over the controversial executive order. Identifying himself only as Tim, the man later crossed enemy lines to pose with plaintiff’s attorney Eisen for a Twitter photo, holding cans of Budweiser. The props at the courthouse tailgate party had an unlikely resonance for today’s hearing. Posing a hypothetical conflict of interest, Daniels asked the government’s attorney to suppose a foreign power gave $1 million to Trump business that sold hot dogs, hoping that the president would sign a treaty. The point the judge had been making was clear. “Just because it’s a business transaction doesn’t mean that it’s not an emolument,” he said.